Fun shape tracing worksheets perfect to get your child ready for Kindergarten! My son will be going to school soon and being able to draw shapes is an important skill he will need to know. He does pretty good with drawing circle and squares but needs some more practice with the rest. Since he loved the Types of Clouds Worksheets I made, I decided to create shape tracing worksheets. Explain how each shape looks. Have them slowly trace the shapes and try very hard to stay on the line. If your child is like mine, he tries to get them done as fast as he can, which is why I try to make him trace slowly. I think he can concentrate better if he goes slowly. Practice proper pencil holding while working on these worksheets. If you need help explaining, I recommend reading this article from Sight and Sound Reading on How to Teach Your Child to Hold a Pencil Correctly. 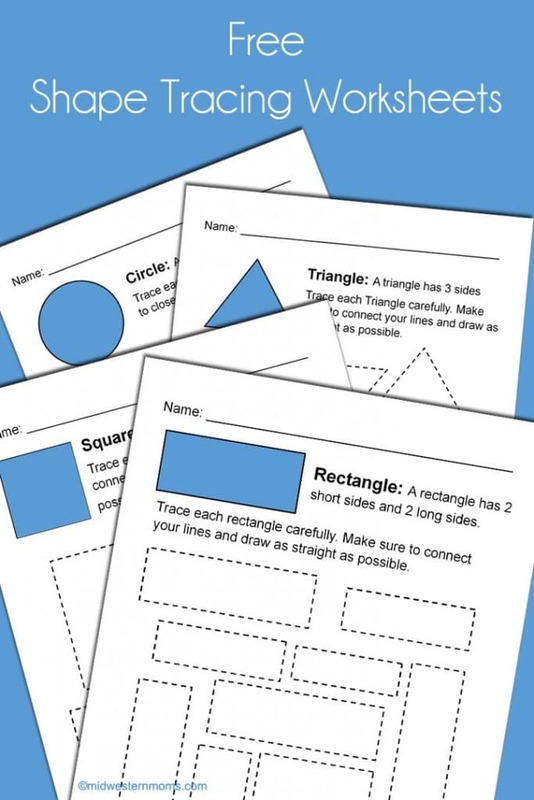 To get your free shape tracing worksheets, enter your email in the newsletter box below. Once entered, an email will be sent to you with the link to the printable and you will be subscribed to our newsletter. Hello, I was trying to download the free worksheets for tracing and cutting, but can not find them. Could you help me please. I put my email in to receive newsletter, but nothing came to my email. Hi Kerri! I will check on this for you. I will send it to the email you indicated on the form. Just got done double checking and it was sent. If you still don’t have it, please let me know. I would also love to know where the link is for downloading and printing. If you could help I would greatly appreciate it! When you put your email into the newsletter box inside the post, you will receive an email with the link. Thanks! I have tried twice and haven’t received the email. Thanks! I am not sure why it was not working for you. I didn’t find you in the system so I added you. I saw the email go out so you should be good.